It felt like Christmas when I woke up on Saturday, September 21. This was the day of the 21st Annual BMI (Blake Maybank Invitational) – one of my favourite days of the year!! The event was originally named in honour of the man who started the tradition by inviting local birders out on Thanksgiving weekend and, while it no longer has anything to do with Blake (who now lives and birds in Nova Scotia) and isn’t always held on Thanksgiving, the name has stuck. The event sees teams of birders spread out over the Avalon peninsula to try and see as many species as possible, especially the rare ones!! (Think of it like a big Christmas Bird Count, but with a bigger focus on finding rarities than counting). It felt like Christmas in another way, too — the temperature was hovering just above freezing as I carried my gear to the car and set out. It had been a cold, clear night with light northerly winds – raising the distinct possibility that many of the birds we had been hoping to find may have caught the breeze south and out of Newfoundland. But whatever the day might bring, it was going to be great one for being out and enjoying it. I picked up my buddy and “teammate” Dave Brown, stopped for the obligatory coffee and breakfast sandwich, and headed south along the east coast to Renews. It was light when we got there at 7:00am, with the low sun sparking on the first frost of the year. We started birding in some of the alder-lined gravel pits north of Renews – such “pits” are well known for attracting and holding migrants (both local and wayward) during fall. At first we saw mostly sparrows (Swamp, Savannah, and White-throated), but 30 minutes and two stops later the activity levels exploded. Yellow-rumped Warblers were popping up all over the pace, with double digits at most stops. Among the dozens of Yellow-rumpeds we also found a few other “local” warblers – Blackpoll, Wilson’s, Yellow, Palm and Common Yellowthroat. A Tennessee Warbler was our first little taste of something that doesn’t usually occur on the Avalon (although they breed commonly in other parts of the island and Labrador). While the activity remained high as we worked our way south to Renews, the variety was low. Everything we were seeing could be considered “local” species, and the big number of Yellow-rumped Warblers indicated that they were gathering on the southeast coast in preparation for a mass exodus. How many birds had left ahead of them during the north winds of the past 24 hours?? We stopped only briefly at Renews since the tide was high and another “team” was expected to cover it later in the day. A flock of 13 Northern Flickers was an odd spectacle, with eight on a single dead tree. At the beach, I only saw two Yellowlegs (one Greater, one Lesser), and we heard one Lapland Longspur flying over. It would be the only one of the day. Activity remained high as we approached Bear Cove – a well known “migrant trap” that we bird on a regular basis. A recent program to clear all the roadside alders in that area has changed the landscape, but fortunately (and somewhat to our surprise) birds still seem to gather there. While Dave birded his way down the hill descending into Bear Cove itself, I headed to the area of a large gravel pit that was still home to lots of alders. Just metres from the car, a bright bird popped out of the trees. I knew it was going to be good, but struggled to get a clear look. 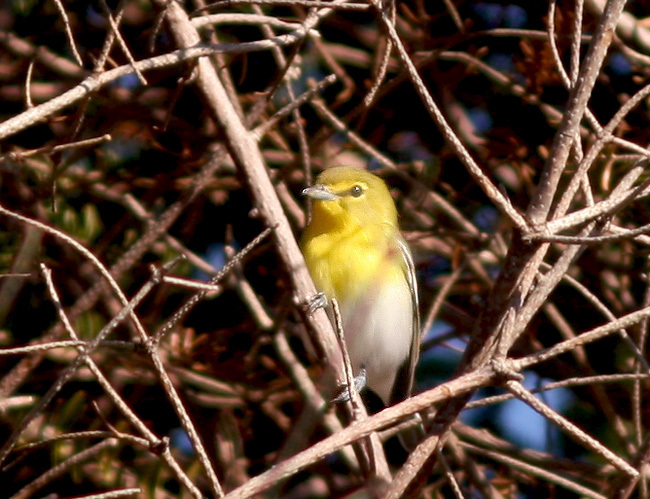 Then it crept into the open — YELLOW-THROATED VIREO!!! This very dull Dickcissel was another good bird, especially for this date. It was found just metres from the vireo. I yelled out to Dave, but he was too far up the road to hear me. I ran for the camera, but the vireo had disappeared in the 30 seconds I was gone. 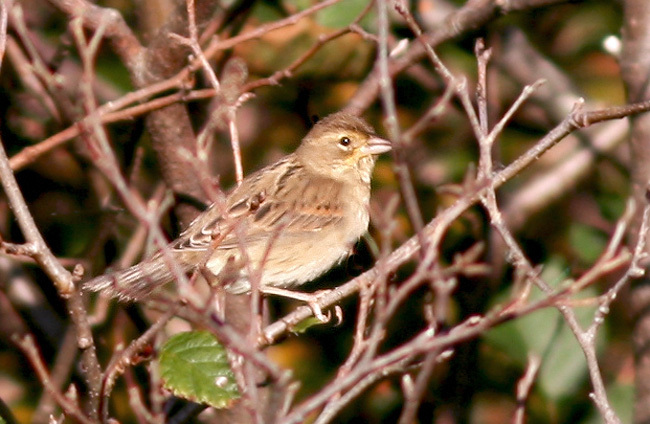 But more birds were moving through, and I soon picked out a very dull Dickcissel low down in the vegetation. I snapped a few photos as Dave was cresting the hill – he had found a Bobolink (the first of at least two we would see during the day). Together we worked the area where I had seen the vireo. A few minutes later we heard a grating chatter reminiscent of an oriole — that was IT! We soon got on the bird again – this time Dave got great looks, and I got some distant record shots. We also found a WARBLING VIREO – another great bird for Newfoundland, although pretty much annual and far less exciting. Through the next hour of working south through Bear Cove and Cappahayden we found two more Warbling Vireos, a Blue-headed Vireo, and another Bobolink. Bear Cove beach had the regular assortment of shorebirds, including several dozen Semipalmated Plover and Semipalmated Sandpiper, four Dunlin, three Sanderling, two White-rumped Sandpipers and one Ruddy Turnstone. Lone Black and Surf Scoters loafed on the water just offshore. This adult male Blue Grosbeak was among the best birds seen all day, although it had been present for a few days so lacked the “exciting discovery” factor 😉 However, we rarely see them in this plumage. The activity had petered out by noon, so we finished covering “our” area and headed further afield to Cape Race (where another “team” had started at first light). It was very quiet along the road, and we later learned it had been so all day. 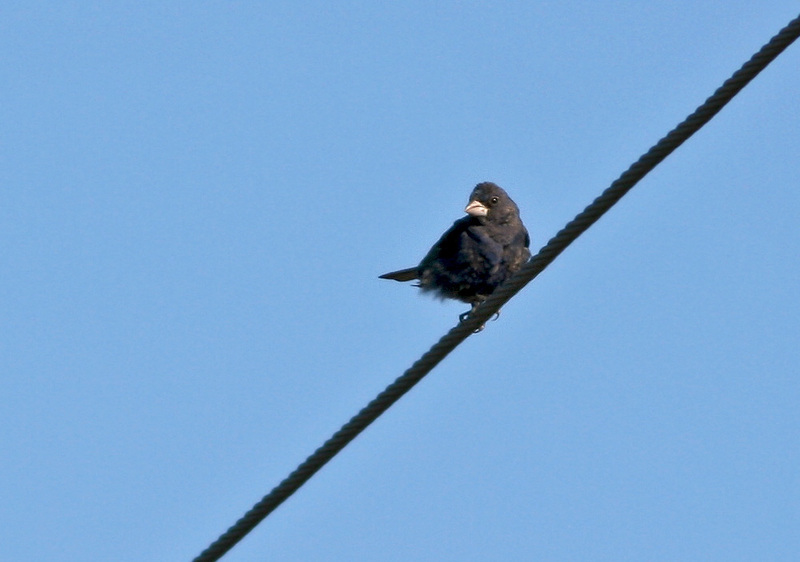 At the lighthouse we saw a brilliant adult male BLUE GROSBEAK – an exciting bird but it had been present and known for several days, so not a surprise. 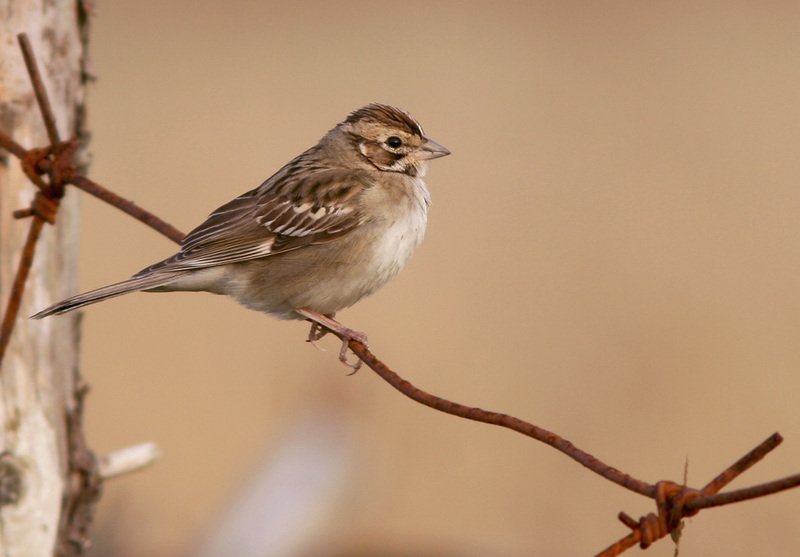 We also saw two LARK SPARROWS at the lighthouse and yet another at nearby Long Beach – an unprecedented total for that species. Along the way home we picked up a Baltimore Oriole for the day, and Dave flushed another (probable) Bobolink. And while I was watching the small flock of shorebirds at Long Beach, a Merlin swooped in and grabbed a Semipalmated Plover just metres in front of me — if only I had been a bit more ready with the camera! 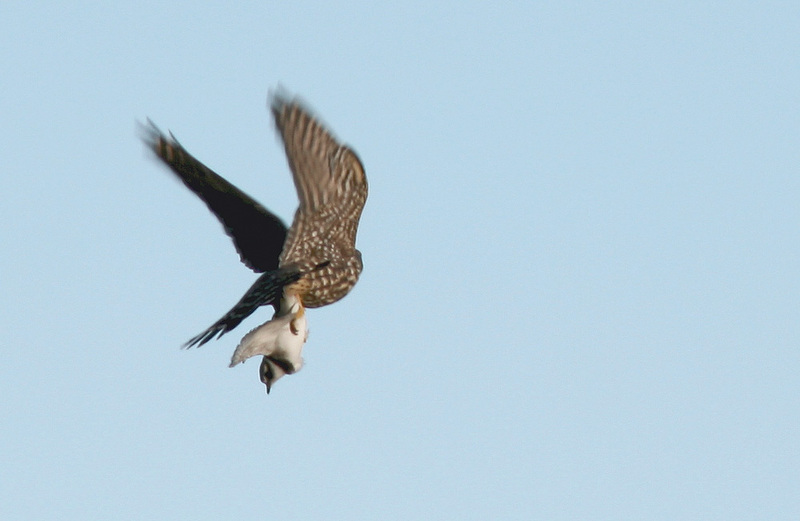 I narrowly missed an awesome (albeit brutal) photo opportunity when this Merlin snagged a plover just metres in front of me — this is the best I could muster. Perhaps the most interesting thing (for me, at least) was a school of Bluefin Tuna leaping out of the water just off the cape, surrounded by dozens of Northern Gannets and gulls and several whales (Minke and Humpback). Those Tuna were a “lifer” and very cool to see in action!! We finished the day with an impressive 75 species, including the best bird of the day! Back at Bruce Mactavish’s house for chili and “refreshments”, we compiled the grand list — overall, the day had produced an excellent 118 species, including two that were new for the BMI (Yellow-throated Vireo & Northern Mockingbird). Other good birds (not seen by us) included a Northern Wheatear, Yellow-billed Cuckoo, Pied-billed Grebe, Baird’s & Buff-breasted Sandpipers, Blackburnian Warbler and an unidentified empidonax flycatcher. Over the past 21 years, a staggering 223 species have been recorded on this event! Not bad for a day’s birding! 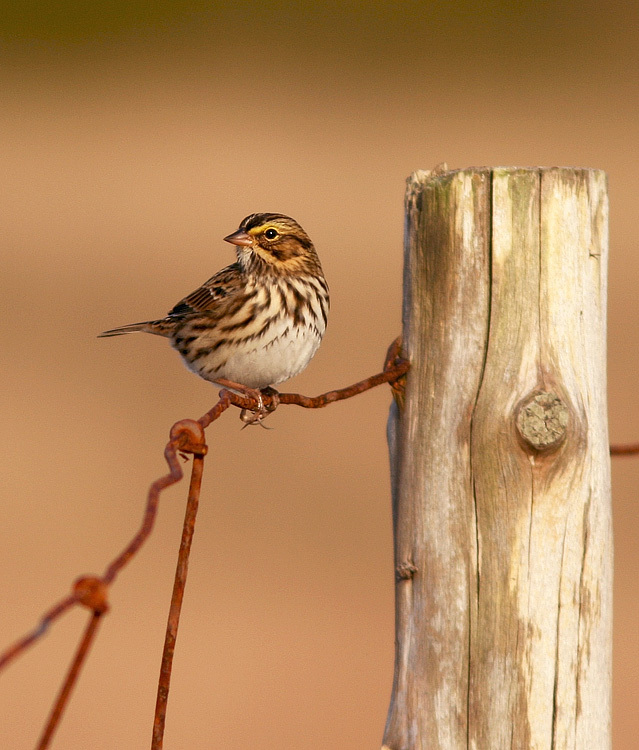 Savannah Sparrows were plentiful along the Cape Race road … their peak out-migration is still a couple weeks away. This entry was posted in Uncategorized and tagged birds, BMI, Cape Race, Newfoundland, rare bird, Renews, Yellow-throated Vireo. Bookmark the permalink.